Climatologists are often asked, "Is climate change making hurricanes stronger?" but they can't give a definitive answer because the global hurricane record only goes back to the dawn of the satellite era. But now, an intersection of disciplines—seismology, atmospheric sciences, and oceanography—offers an untapped data source: the continuous seismic record, which dates back to the early 20th century. 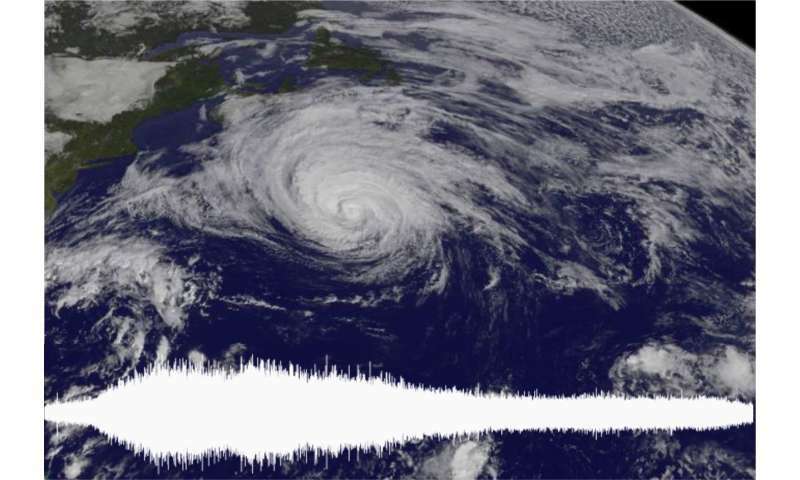 An international team of researchers has found a new way to identify the movement and intensity of hurricanes, typhoons and other tropical cyclones by tracking the way they shake the seafloor, as recorded on seismometers on islands and near the coast. After looking at 13 years of data from the northwest Pacific Ocean, they have found statistically significant correlations between seismic data and storms. Their work was published Feb. 15 in the journal Earth and Planetary Science Letters. The group of experts was assembled by Princeton University's Lucia Gualtieri, a postdoctoral research associate in geosciences, and Salvatore Pascale, an associate research scholar in atmospheric and oceanic sciences. Most people associate seismology with earthquakes, said Gualtieri, but the vast majority of the seismic record shows low-intensity movements from a different source: the oceans. "A seismogram is basically the movement of the ground. It records earthquakes, because an earthquake makes the ground shake. But it also records all the tiny other movements," from passing trains to hurricanes. "Typhoons show up very well in the record," she said. Because there is no way to know when an earthquake will hit, seismometers run constantly, always poised to record an earthquake's dramatic arrival. In between these earth-shaking events, they track the background rumbling of the planet. Until about 20 years ago, geophysicists dismissed this low-intensity rumbling as noise, Gualtieri said. "What is noise? Noise is a signal we don't understand," said Pascale, who is also an associate research scientist at the National and Oceanic and Atmospheric Administration's Geophysical Fluid Dynamics Laboratory. Just as astronomers have discovered that the static between radio stations gives us information about the cosmic background, seismologists have discovered that the low-level "noise" recorded by seismograms is the signature of wind-driven ocean storms, the cumulative effect of waves crashing on beaches all over the planet or colliding with each other in the open sea. One ocean wave acting alone is not strong enough to generate a seismic signature at the frequencies she was examining, explained Gualtieri, because typical ocean waves only affect the upper few feet of the sea. "The particle motion decays exponentially with depth, so at the seafloor you don't see anything," she said. "The main mechanism to generate seismic abnormalities from a typhoon is to have two ocean waves interacting with each other." When two waves collide, they generate vertical pressure that can reach the seafloor and jiggle a nearby seismometer. When a storm is large enough—and storms classified as hurricanes or typhoons are—it will leave a seismic record lasting several days. Previous researchers have successfully traced individual large storms on a seismogram, but Gualtieri came at the question from the opposite side: can a seismogram find any large storm in the area? Gualtieri and her colleagues found a statistically significant agreement between the occurrence of tropical cyclones and large-amplitude, long-lasting seismic signals with short periods, between three and seven seconds, called "secondary microseisms." They were also able to calculate the typhoons' strength from these "secondary microseisms," or tiny fluctuations, which they successfully correlated to the observed intensity of the storms. In short, the seismic record had enough data to identify when typhoons happened and how strong they were. So far, the researchers have focused on the ocean off the coast of Asia because of its powerful typhoons and good network of seismic stations. Their next steps include refining their method and examining other storm basins, starting with the Caribbean and the East Pacific. And then they will tackle the historic seismic record: "When we have a very defined method and have applied this method to all these other regions, we want to start to go back in time," said Gualtieri. While global storm information goes back only to the early days of the satellite era, in the late 1960s and early 1970s, the first modern seismograms were created in the 1880s. Unfortunately, the oldest records exist only on paper, and few historical records have been digitized. "If all this data can be made available, we could have records going back more than a century, and then we could try to see any trend or change in intensity of tropical cyclones over a century or more," said Pascale. "It's very difficult to establish trends in the intensity of tropical cyclones—to see the impact of global warming. Models and theories suggest that they should become more intense, but it's important to find observational evidence." "This new technique, if it can be shown to be valid across all tropical-cyclone prone basins, effectively lengthens the satellite era," said Morgan O'Neill, a T.C. Chamberlin Postdoctoral Fellow in geosciences at the University of Chicago who was not involved in this research. "It extends the period of time over which we have global coverage of tropical cyclone occurrence and intensity," she said. The researchers' ability to correlate seismic data with storm intensity is vital, said Allison Wing, an assistant professor of earth, ocean and atmospheric science at Florida State University, who was not involved in this research. "When it comes to understanding tropical cyclones—what controls their variability and their response to climate and climate change—having more data is better, in particular data that can tell us about intensity, which their method seems to do. ... It helps us constrain the range of variability that hurricane intensity can have." This connection between storms and seismicity began when Gualtieri decided to play with hurricane data in her free time, she said. But when she superimposed the hurricane data over the seismic data, she knew she was on to something. "I said, 'Wow, there's something more than just play. Let's contact someone who can help." Her research team ultimately grew to include a second seismologist, two atmospheric scientists and a statistician. "The most challenging part was establishing communications with scientists coming from different backgrounds," said Pascale. "Often, in different fields in science, we speak different dialects, different scientific dialects." Once they developed a "shared dialect," he said, they began to make exciting discoveries. "This is how science evolves," said Pascale. "Historically, it's always been like that. Disciplines first evolve within their own kingdom, then a new field is born."